the problems faced by homeless people and support staff have become much more complex over recent years. Many workers are not trained to deal with the personal and social challenges faced by homeless people. The study found that 60% of frontline workers entered the profession with less than two years of post-secondary education. This, in turn, is linked to another troubling fact uncovered by the study: over 70% of respondents earn less than $50,000 annually. “Frontline work is not entry-level work, even though it’s perceived that way and funded that way. 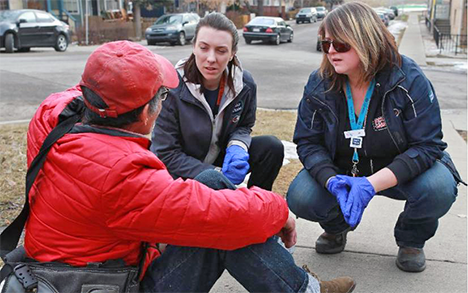 It takes a tremendous amount of skill to deal with situations effectively and in the moment,” explained Sandra Clarkson, executive director of a drop-in centre in Calgary. An additional factor driving the high rates of PTSD among frontline workers is the close relationships they develop with their clients. “They see the discrimination, they see the things the families encounter that is preventing them from moving on with their lives, and there’s a personal investment there,” said Louise Gallagher, executive director of the homeless support service In From the Cold. Chronic underfunding from successive provincial and federal governments is at the root of these problems. Clarkson points out demand for her centre’s services has increased steadily for ten years, while funding from the province has not. Inadequate budgets mean that shelters and other support centres are forced to rely on inexperienced personnel. For example, 43% of respondents in the study said they have been in their jobs for less than two years, while fully three quarters had less than five years of work experience. In a 2016 study Waegemakers-Schiff pointed to a shortage of addiction councillors. “Even when those with a university degree are factored into this picture, most do not come to their positions with training in interview, counselling or intervention skills. Improving the crisis conditions confronting support workers with the homeless, and with the homeless themselves, requires significantly more investment by government. It is only with adequate funding that workers with the necessary skills can be hired, employees compensated fairly, and workers provided with necessary training and support. However, Waegemakers-Schiff also points out that simple policy changes could make things a lot easier for frontline support workers. “They can’t take a mental health day, or take time off because its frowned upon,” she said. This needs to be part of a “root shift in organizational culture” focused on practices to deal with high stress levels of staff, adds Waegemakers-Schiff. The high rates of mental health hazards for workers with the homeless is a serious problem that must be acknowledged and remedied. But the deeper problem is homelessness itself. The real lasting remedy, for the frontline workers and the homeless, would be ending homelessness. We will only achieve this once our governments add decent and affordable housing, accessible to all, to our Canadian Charter of Rights and Freedoms.